Do y’all know if there is a pre-wired connection in the 2018 21 MLX for RGB lights? I have the option to turn it on and off on the 7” screen but didn’t order the lights as an option. If there is one or multiple locations could you please tell me where I could find them? I am assuming that I’ll just need to buy the controller and run the lights once I find it. Thanks for the help! If this is a repeat topic I apologize, I couldn’t find the information on the forum. No pre-wire for RGB in the boats. And the factory Malibu RGBs are 5v(at least the cupholders are, I havent seen the others), and use their own controller module. So not even a two-wire power cable? Curious as to how the screen could turn it on or off? Is there a proprietary connection on the back of the screen or something? As far as I can tell, this is an option on the M235. To use that option on the 7" screen, you'll need the controller from Malibu to interface with the screen switch. then wire your LED's off that controller. There my be more as I haven't looked at it that close. From COOP's post above, and you should trust his opinion, it looks like it needs to be 5v LEDS but most 12v LEDS may light up with 5v, just won't be very bright. There are plugs for two wire LEDs for docking and underwater lights. The screen switches for these can be turned on in the screen settings. Sorry, I just re-read the post above. Didn’t realize he said to use the factory controller. I’ll do that and buy the 5v LEDs online. Thanks for the help! As far as docking lights; where is that connection? 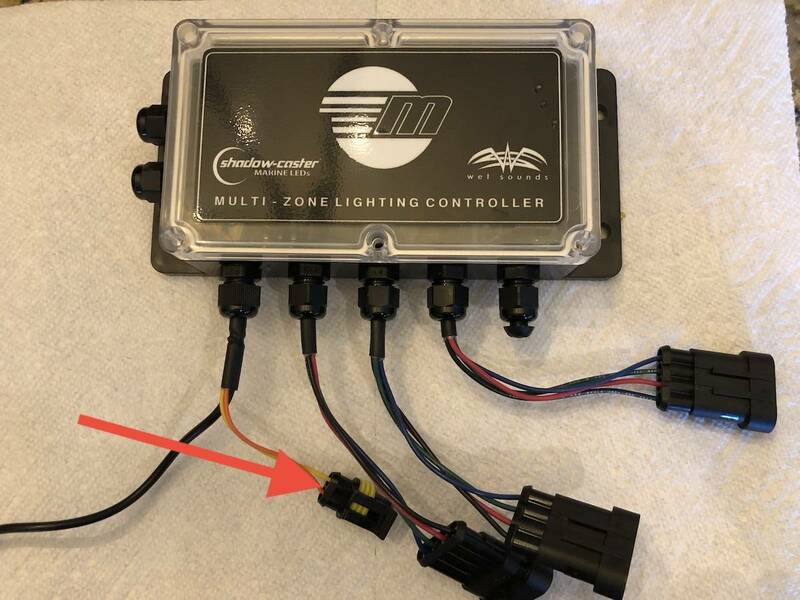 I am almost positive I know where the swim light connections are (based on info from this forum) just haven’t actually looked for them yet. There is also a two wire plug (Neg connection) for front and rear tower lights that can be enabled and used to switch 12v lights. If you hook up 5v leds to a 12v setup they will pop. You would need the 5v controller. I ordered the ShadowCaster RGB controller. It’s the one that hooks up to the factory 7” screen. According to the installer it uses 12v LEDs but I’ll research more of that later. For now I need to know what wires I run to the CAN connection on the RGB box. According to the same guy I have to tap into two wires from the back of the screen. He said it should be a blue wire and a white wire. He also said that it’s not an obvious connection nor is it labeled. Does anyone have a picture of this? Also, which wire goes where on the box? Sorry for all the questions. I’m just trying to save $250 for him to hook up two wires. I'm out on that question. I don't have a knowledgable answer. 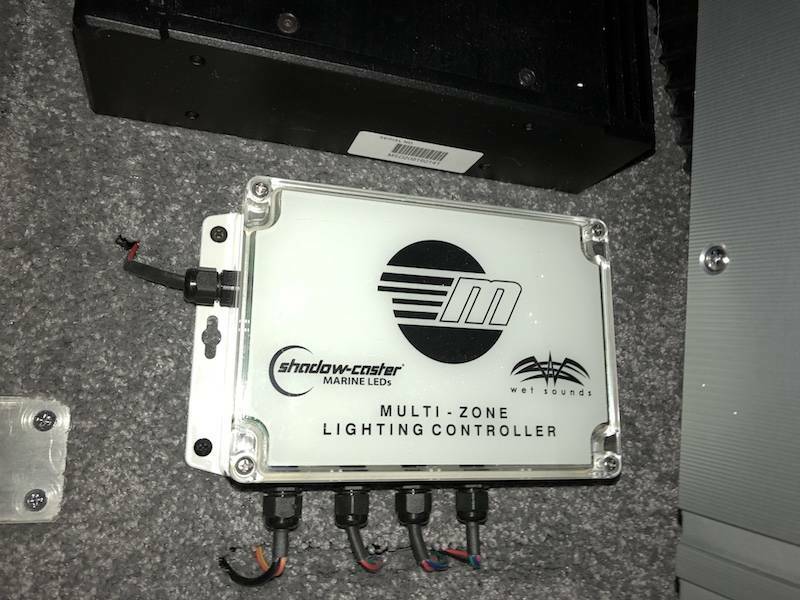 I have run Shadow Caster transom lights before and they were the best. If you buy the controller from them you should make sure that the one from Malibu hasn't been tweaked to work with the system Malibu uses and the one from Shadow Caster hasn't. Texas Turner, Did you ever figure out where it connects to the viper ii system? Hi, did anyone work out where the RGB controller connected? Does it connect to the Medallion viper II controller? I have all the parts waiting on my boat to get here. Should be any day now as it was built last week. I’ll get it figured out and post back. I'm being told the Shadow Caster/Wetsounds/Malibu RGB connection box connects (red arrow below) to the Can Bus connector on the M235 Black Box. That Can Bus connector is only on the M235 box from what I understand. You'll need the M235 black box as well as the Connection Box to complete this project.